In the eyes of many American politics has undergone a steady deterioration over the course of the years. According to a Gallup poll, the percentage of Americans who approve of the actions of Congress has not gone above 20% in the last 5 years. Other facts are even more striking. In the last 40 years this percentage has only dipped below 20% twice, once in 1979, and again in 1992. Looking at the political events of the last 40 years, it’s hard to believe. Numerous wars, the counterculture of the 1970’s, you name it. In the recent 2014 general election, voter turnout was at a 70 year low. Another quick statistic: in the general election the total amount spent by all candidates was $1,039,800,630. It’s an astounding number. Doing some simple math, it comes out to $721,082 per candidate. A number like that makes politics seem distant to the common person. Never has politics been so expensive. But the most harrowing number is the voter turnout among young people. 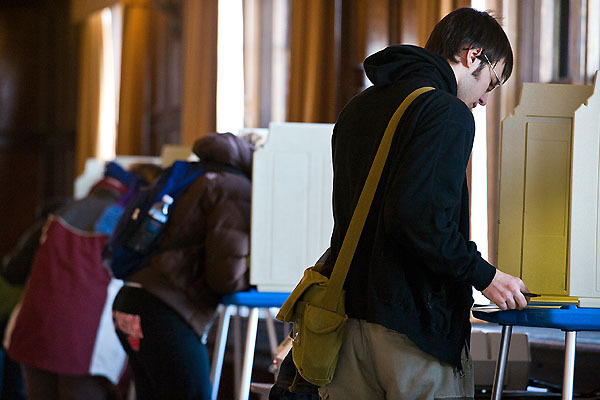 Only 23.5 percent of people ages 18 to 29 turned out for the general election. These facts are alarming and disturbing. Oh but it gets better! At the time of the election the Congressional approval rating was at 11%. Here’s the best part, 95% of folks in Congress were re-elected. Let’s recap. Lot’s of money, 1,039,800,630 to be exact, less people voting, and specifically a dismal amount of young people voting. Of course we are missing one thing, and that’s change, obviously based on the 95% re-election rate. The numbers leave me baffled. Perhaps young people see through to this lack of change, and don’t wish to vote for it seems to change nothing. Seemingly most of the campaigns of men such as Rand Paul, Ted Cruz, and Jeb Bush rest upon fixing a “broken” Washington. However, I have yet to hear what they’re going to do about it. So of course we young people see the flawed rhetoric and we refuse to vote for these people! Perhaps this is not the case. I would imagine a majority of younger people couldn’t tell you what rhetoric is, let alone critique political ideas. I surely wasn’t taught a thing about rhetoric in high school. Our destitute education system would leave many intelligent hopefuls deep in debt after attending college, and many others who didn’t attend college with a poor excuse for an education. Education is the key to understanding the character, policies, and ideas these politicians present rather than believing the bully pulpit. After sitting through an American government class in the California public school system, I can say many gained little, and retained little. We have been trained to retain and forget. There is no emphasis on education. There is only retention for the sake of getting the answer right on the test. It seems that is what matters to the American student. I ask, does Ted Cruz appeal to the average 20 year old? What about Jeb Bush? I think many younger people feel that the political game is rigged, and that they are powerless. I think the younger generation is more fired up about the state of the country than anyone else. But what is the appeal in voting for a young person? Perhaps the lack of interest is because they are scared off by what they see in Washington, and they see no clear answers.